Bottom line up front; Once I got used to the shape, the best comb I've used for my beard so far. Recommended, especially if you have a stiff wrist or need help shaping your beard. Alongside the metal beard comb I posted about last week I received a wooden, boomerang shaped one that is my current favourite beard comb. After a a few minutes of initial puzzlement as to how to hold it properly, using it was a breeze. The L-shape lets me grasp the comb in several ways a normal comb won't, allowing me to comb my beard from all angles without having to twist my wrist. 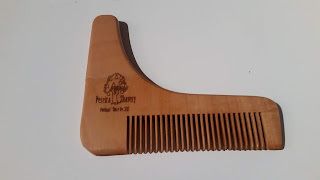 The comb itself is - according to Pereira's website - hand sawed from pear wood. 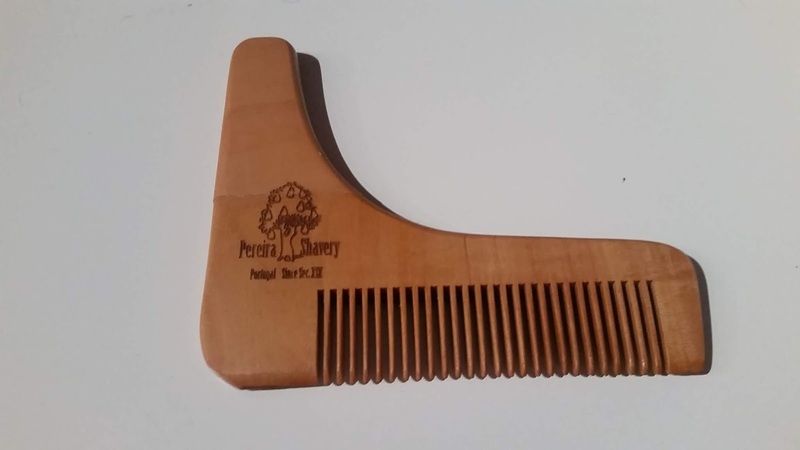 Pear wood is a good choice for a couple of reasons; not only is it a hardwood which makes for a durable comb, but it's also a great callback to the name Pereira - which means "pear tree" in Portuguese. It's also a renewable resource, which is a good thing all by itself. The comb is fairly narrow toothed, and I've found that it'll easily undo most tangles in my beard. My only wish for improvement would be that the teeth were cut further towards the edge on the handle side of the comb, but that is a fairly minor issue. It works great on head hair as well, in case you're curious. The boomerang shape also is a useful guide in shaping your beard, thus keeping it symmetrical and even. The comb even comes with a handy tri-lingual instruction sheet for how to do just that, written in Portuguese, English and what Google Translate assures me is French (disclaimer; I don't read neither Portuguese nor French). The soft curve on the inside of the comb can be used for defining the neckline of the beard and the outer curves, and the straight side is good for helping keeping the sides of my goatee from waving as well as maintaining other straight lines. The packaging also shows the innovative mindset that Pereira displays in several of their products; it came in a CD-case. It can also - I assume - be stored in that case if you so desire, however I use mine every day and as such there is no need to store it; I just keep it on my bath room shelf. The Pereira Boomerang beard comb have become my daily driver to get my goatee ready to face the world. If you only want one comb, this would be a good choice. I'm not bearded, but that is one cool item. I especially like the bit about the pear wood. Trivia: Pereira was Aerosmith guitarist Joe Perry's family name at birth. His father Anglicized it.